Indonesia Festival 2010 (インドネシア祭り) is a friendship and awareness festival between Indonesia and Japan. It was held in Yoyogi Park. There are many food stands which you can enjoy great Indonesian food. Also, there are many traditional stuff of Indonesia, including dance and music, craft works, and arts. Indonesian festival is for enjoy their food, dance, music and culture. "Great friendships and connection between Indonesia and Japan! 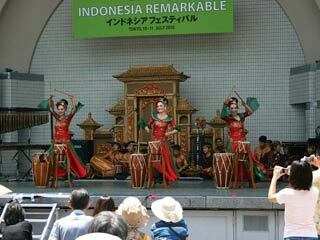 July 10, 2010, MLJ joined Indonesia Festival at Yoyogi Park. The traditional dance and music were amazing. And lots of nice people there with traditional Indonesian clothes. Especially, we enjoyed eating Indonesian food. There is special food gifts from the first lady of the indonesian ambassador. Those traditional foods were all great. We enjoyed them, and strongly recommend those traditional Indonesian food for all Japanese people. MLJ truly appelicate the great friendships and relationship between Indonesia and Japan. Best wish to keep our relationship forever.